Sometimes people ask me if I'm an artist and I usually just say that I pretend. I love making art, but I've always felt that if my job wasn't in the arts, then I didn't really deserve to call myself an artist. I guess I just don't really want to disappoint people or want people to judge me once I tell them I'm an artist. For me, declaring you're an artist means that you are good at art. I've decided that even bad artists are still artists, and hey, I could be one of those! I'll just be forever learning. Sometimes I start pieces where the inspiration is huge. I have this grandiose idea of how it's going to come out. And then I get halfway through, and it's looking pretty good by my standards, and then I start to freak out because I think maybe the result won't be able to live up to my own expectations. 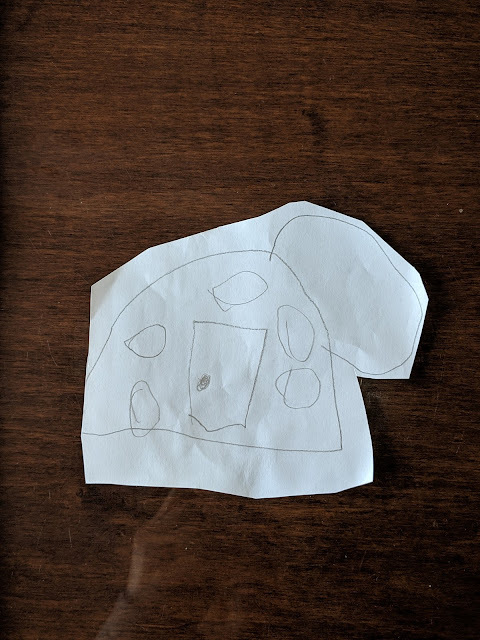 My five-year-old son drew this picture of a house and I think it's amazing. This prompts me to want to paint my own version of this house. I start painting it and it is really fun. No pressure, simple to draw, not a lot of up front work. But then, I start liking it too much, and I became terrified that I am going to wreck it. I know I can draw it again, but I'm filled with such anxiety... what goes in the foreground? 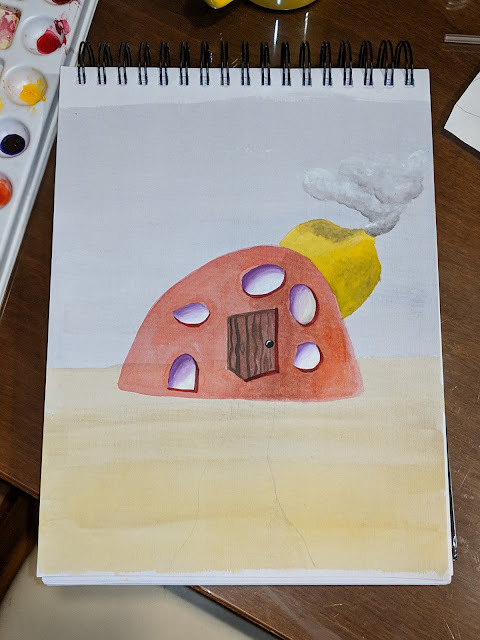 How am I going to make the chimney look like it's part of the house instead of just a smoking lemon in the back? Where is the sunlight? I don't know where everything is and I have no example to Google image search because this only exists in my imagination!!! So, I work on other things. This picture of my dog and her toy requested by a friend comes out pretty well. I know the tail end looks kind of weird because the photo had cut that portion off of my dog, so I was really just guessing (which is a BAD thing to do based on instruction from The Big Painting Challenge BBC show I just started watching). This has happened before. 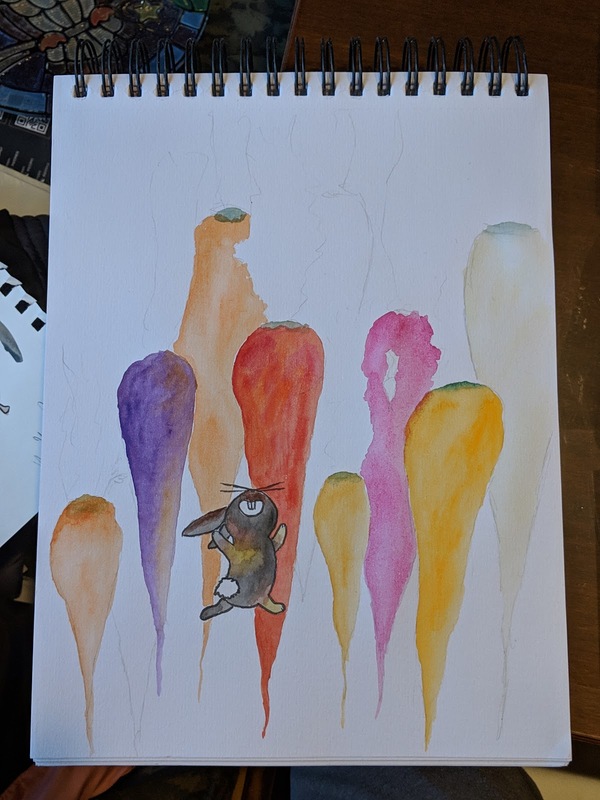 A few weeks ago, I started painting this idea that I had for "Rabbit Dreams." I had to stop because it was time to go to work, or any number of reasons that a working mom of a five-year-old has to stop doing something. Since then, I have not been able to return because of the same reason - I really like where it's going, but there's a strong possibility I could take a hard right and make it horrible. "Just start over then!" my brain always says. But, my heart is afraid of being broken by my lack of present ability. I'm typically able to save things that go sideways, and it's not like these paintings take me hours and hours. In fact, the painting that DID take me a really long time doesn't even really look that much better than the work that I try to finish in an hour or less. Those little hairs took forever. I don't even feel like it's that impressive. And the rainbow background is just distracting. I've found watercolors look better when the background is a striking difference in value from the main subject, i.e. 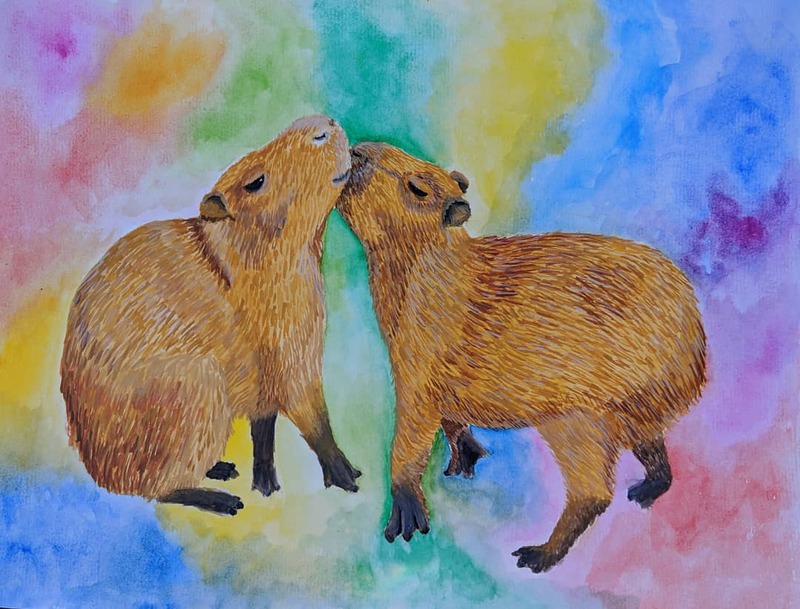 if the subject is light in color, the background looks better if it's dark, and if the subject is dark in color, the background looks better if it's light. I think either no background or a very light / dark background would have been better. The middle ground I chose disappoints me. There are no shadows on the ground, so they're just floating in nothingness, I suppose. My grandfather and all his siblings were amazing artists. So gifted. I wish my grandfather could still remember and communicate coherently. He's the last of his siblings and the only one I could even ask now. I would ask him about what it was like for him to draw something and how it made him feel. Did he ever have moments of doubt when he was working on something he thought was really special? Was most of his work just for fun so he never really felt that way? Or did he always just have the confidence to know that it was going to turn out if he kept working on it because he trusted in his skills? My mom and dad drew when they were younger, but they don't really anymore. My dad liked drawing little cartoons, and my mom drew fashion, people, and dolls. "I made paper dolls and drew clothes for them because I didn't have any toys," she says. She always draws with such confidence. I decide to ask my parents about their method. "When you would draw stuff, would you ever get halfway through and then worry that it wasn't going to be very good when you finished so you'd stop and get stuck?" Both laugh, look at me like I'm crazy and say, "No." I show my mom my halfway finished artworks. "Those are good!" she says. Sigh. 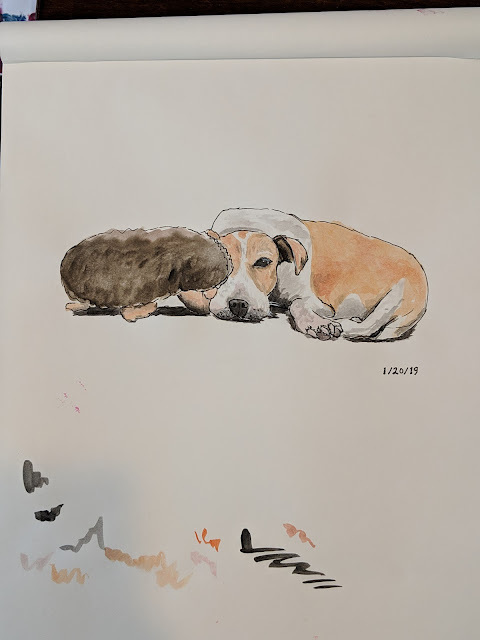 As I am working on this entry, I re-read the previous entry about me asking my grandfather to draw while we were in the rehab center with my grandmother. He had surrendered only after a minute or two, his drawing disappointing him so much that he didn't want to continue. At least he didn't really remember being an artist; he had said that he always remembered that it was me who was the artistic one, which was so far from the truth when it came to his now long-gone skills. "Don't worry so much; they haven't bathed in this long. What's the worst thing if they don't?" Afram asked me on our way home from the gym yesterday when I was telling him about how I couldn't stop thinking about trying to get my grandparents to bathe while I was on the treadmill. "I don't know... I guess you're right," I sighed. "I'm not trying to argue with you, I'm just trying to get you to think logically about it." "Yeah, I agree. They're fine not bathing..."
"Baby steps. If they don't agree to bathe, you can at least do some laundry like you said," he replied, patting my leg. I felt better. If it really upset my grandmother, it probably would be fine if at least I could just trick them into some clean clothes. When I went with my grandfather and my parents to visit my grandmother in rehab on May 3rd, I brought a drawing pad for him and some watercolor crayons. He used to always draw with me and was a wonderful artist. He sat at the edge of her bed and I sat in a chair next to him. I asked him to draw something and he just looked at me confused. "I don't know what to draw," he said. "How about... a dog?" I asked. He took the pad and stared at it for a while, the crayon in his hand. "I can't," he said. "You were always the artist." What? He had to be kidding. My grandfather used to be able to draw and make anything and everything. I remembered one time, he carved a beautiful Chinese New Year lion out of a bar of soap for a school project where I was supposed to carve something. Now he couldn't even draw a dog? She pushes the noodles of her Vietnamese mixed bun bowl around. "Look, there's nothing here!" She has already given most of the meat and imperial rolls from her meal to my grandfather and my dad. All that's left are the noodles. My dad asks me about work and we chat a little bit. "This wouldn't even cost fifteen cents," she says angrily, pushing the noodles around in the bowl some more. "Look at this!" 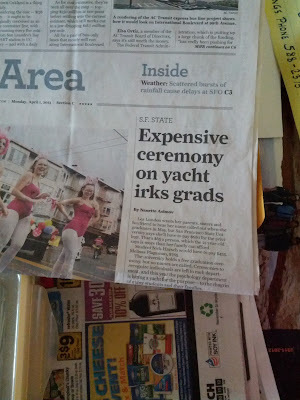 My grandfather joins in. "Everything is just warm, not even hot." "I'm never coming back here. Ever!" She pushes the noodles around continually, demanding that we look at it. My father just smiles at her. "You're going to forget in three minutes anyway." "I don't even think it will be three whole minutes," I reply to my dad. "Not even fifteen cents!" she mutters again.